A.P. Møller – Mærsk A/S (Danish pronunciation: [ˈæːˀ ˈpeːˀ mølɐˈmæɐ̯sg]), also known as simply Maersk, is a Danish business conglomerate with activities in the transport, logistics and energy sectors. Maersk has been the largest container ship and supply vessel operator in the world since 1996. The company is based in Copenhagen, Denmark, with subsidiaries and offices across 130 countries and around 88,000 employees. 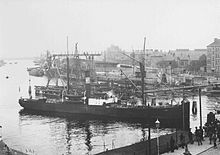 Dampskibsselskabet Svendborg (Danish for "Svendborg Steamship Company") was founded in Svendborg in April 1904 by captain Peter Mærsk Møller (1836–1927) and his son Arnold Peter (A. P.) Møller (1876–1965). A. P. Møller had four children, all by his first wife Chastine Estelle Roberta Mc-Kinney. Their second child was (Arnold) Mærsk Mc-Kinney Møller (1913–2012), who became a partner in 1939 and head of the firm upon his father's death. In 1993, he was succeeded as CEO by Jess Søderberg. He continued as chairman until December 2003, at which point he was 90 years of age and Michael Pram Rasmussen took over. Mærsk Mc-Kinney Møller was until his death one of the "managing owners" of the company and was chairman of Odense Steel Shipyard until 2 May 2006. In 2017, the company was one of the main victims of the NotPetya ransom malware attack, which severely disrupted its operation for several months. P. M. Møller (1836–1927), who was a deeply religious Christian, attached a blue banner with a white seven pointed star on both sides of the black chimney on the steamship Laura when his wife recovered from illness. In a letter to his wife, P. M. Møller explained in October 1886, "The little star on the chimney is a memory of the night when I prayed for you and asked for a sign: If a star would appear in the gray and cloudy sky, it would mean that the Lord answers prayers." The same star later became the emblem of the Maersk Group. A.P. Moller–Maersk is structured into two main business segments: transport & logistics and energy. These two branches include several subsidiaries such as container shipping and related activities; APM terminals; tankers, training, offshore and other shipping activities; oil and gas activities; retail activity; and shipyards, other industrial companies, interest in Danske Bank, etc. "Container shipping and related activities" is the largest business area for A.P. Moller–Maersk, providing almost half of the group's revenue in 2008. It comprises worldwide container services, logistics and forwarding and terminal activities under the brand names: Maersk Line, Safmarine, and Damco. 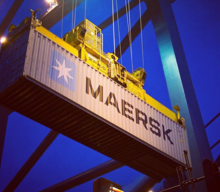 Since 1996, Mærsk has been the largest container shipping company in the world. The largest operating unit in A.P. Moller–Maersk by revenue and staff (around 25,000 employees in 2012) is Maersk Line. In 2013, the company described itself as the world's largest overseas cargo carrier and operated over 600 vessels with 3.8 million twenty-foot equivalent unit (TEU) container capacity. As of September 2015, as the largest container fleet, it held 15.1% of the global TEU. In 2006, the largest container ship in the world to that date, the E-class vessel Emma Maersk, was delivered to Maersk Line from Odense Steel Shipyard. Since, seven other sister ships have since been built, and on February 21, 2011 Maersk ordered 10 even larger container ships from Daewoo, the Triple E class, each with a capacity of 18,000 containers. The first were delivered in 2013. There was an option for 10–20 more, and in June 2011, Maersk placed a follow-on order for a second batch of ten sisterships (to the same design with the same shipyard,) but cancelled its option for a third batch of ten. As of February 2010, Maersk had an order book for new ships totalling 857000TEU (including options on the Triple E class); that backlog is larger than the existing fleet of the fourth-largest line, Evergreen Line. Maersk Line cooperated with the US Navy on testing 7–100% algae biofuel on the Maersk Kalmar in December 2011. In January 2012, Søren Skou took over as CEO of Maersk Line from Eivind Kolding. Later that year, the company ceased its business in Iran in order to prevent potential damage to the company's business with Western countries, particularly the US, due to the sanctions regime led by those countries. Europe: Algeciras, Aarhus, Barcelona, Bremerhaven, Gothenburg, Port of Poti, Rotterdam-Maasvlakte, Rotterdam-Maasvlakte 2, Wilhelmshaven-JadeWeserPort, Valencia, Gijon, Izmir, Zeebrugge. North America: Los Angeles, Miami, Mobile, Port Elizabeth, Tacoma. Asia: Cai Mep, Colombo, Dalian, Guangzhou, Kobe, Laem Chabang, Karachi, Pipavav, Qingdao, Tanjung Pelepas, Tianjin, Shanghai, Xiamen, Yokohama, Dhaka. Africa: Abidjan, Apapa, Cotonou, Douala, Luanda, Monrovia, Onne, Pointe Noire, Port Elizabeth, Tangier, Tema. Maersk Container Industry A/S: Container manufacturing with factories in China (Dongguan and Qingdao) and headquarters in Denmark (Tinglev). Container Inland Services: Includes: depots, equipment repair, trucking, container sales and related activity. Damco is the combined brand of the Maersk Group's logistics activities previously known as Maersk Logistics and Damco. Damco has 10,800 employees in offices in more than 93 countries. and is involved in supply chain management and freight forwarding all over the world. Damco is the seventh largest freight forwarding company in the world. Maersk Oil (Danish: Mærsk Olie og Gas A/S) was established in 1962 when Maersk was awarded a concession for oil and gas exploration and production in the Danish sector of the North Sea. Today, Maersk Oil is engaged in the exploration for and production of oil and gas in many parts of the world. Total oil production is more than 600,000 barrels per day (95,000 m³/d) and gas production is up to some 1 billion cubic feet (28,000,000 m³) per day. Most of this production is from the North Sea, from both the Danish and British sectors, but there is also production in offshore Qatar, in Algeria and in Kazakhstan. In addition to the above-mentioned producing sites, Maersk Oil is involved in exploration activities in Danish, British, Dutch and Norwegian sectors of the North Sea, Qatar, Algeria, Kazakhstan, Angola, Gulf of Mexico (US sector), Turkmenistan, Oman, Morocco, Brazil, Colombia and Suriname. Most of these activities are not 100% owned but are via membership in a consortium. The company prides itself for having developed production techniques especially suited to difficult environments (The North Sea, etc.) and for drilling techniques that succeed in extracting oil from problematic underground conditions. "Oil and gas activities" provided A.P. Moller – Maersk with 22% of its revenue and 68% of its profit in 2008. On August 21, 2017, A.P. Møller - Mærsk A/S announced the signing of an agreement to sell Mærsk Olie og Gas A/S to Total S.A. for US$7.45 billion in a combined share and debt transaction. The transaction was subject to regulatory and competition approval and was closed on 8 March 2018, when Maersk Oil became a part of Total. Maersk Drilling supports global oil and gas production by providing high-efficiency drilling services to oil companies around the world. The company owns 24 rigs and its fleet consists of six Ultra-Harsh jack-ups, four XL Enhanced jack-ups (including one new build which is set for delivery in late 2016), four Harsh jack-ups, two Premium jack-up, four semi-submersibles and four Ultra deepwater drillships. Maersk Drilling is among others a market leader in challenging Norwegian jack-up market with a market share of 7 out of 12 rigs (2016). Maersk Supply Service provides anchor handling, towage of drilling rigs and platforms as well as supply service to the offshore industry. By the end of 2008, the fleet comprised 39 anchor handling vessels (including one chartered vessel), 11 supply vessels and 3 other vessels, and with 14 anchor handling vessels and 2 supply vessels on order. Maersk Line, Limited is a US-based subsidiary of A.P. Moller–Maersk Group which manages a fleet of US-flag vessels and provides U.S. Federal Government agencies and their contractors with transport and logistics services. Headquartered in Norfolk, Virginia, it manages the world's largest fleet of US-flag vessels. Beginning with a relatively small number of vessels focused on handling commercial and US Federal Government-subsidised cargoes, MLL's fleet of vessels engaged in commercial liner services. MCC Transport sells containerized cargo services in the Intra-Asia market. Seago Line is a subsidiary shipping line which serves ports with the Mediterranean. SeaLand is an American regional maritime and logistic operator, that offers intermodal services in between North, Central and South America. It is part of A.P. Moller - Maersk since 1999. Maersk GSC operates shared service centres that handle back office, off-shore activities for AP Moller Maersk Group. GSCs are located in Chennai, Mumbai, Pune, Bengaluru, Chengdu, and Metro Manila. Tankers, offshore and other shipping activities" was responsible for 8.8% of Maersk's revenue in 2008, and posted 25% of the group's profit for this period. The business segment comprises Maersk Tankers, Maersk Supply Service, Maersk Drilling, Maersk FPSOs, Maersk LNG and Svitzer. Ardent Salvage, a joint operating salvage company formed after the merger between Maersk-operated Svitzer and Crowley-operated TITAN Salvage, is involved in towage, salvage, wreck removal, marine firefighting and other offshore support and is represented in more than 100 ports worldwide. Ardent is based in Houston, Texas. 37.6% ownership share of Höegh Autoliners, with handover of 18 Maersk pure car/truck carrier (PCTC) vessels to them. By the end of 2008, Höegh Autoliners operated 67 car carriers with a transported volume of 1.9 million car units annually. The company owns a 19% stake in Dansk Supermarked Group which operates stores under the brands: Bilka (hypermarket), Føtex (supermarket, department store), Salling (department store) and Netto (discount supermarket). Maersk Training provides specialist training to specific industries. The 2010 merger of Maersk Training Centre and Svitzer Safety Services broadened a portfolio of courses to include the maritime, oil and gas, terminals, and wind power industries. With Headquarters in Svendborg, the MT Group global locations include Aberdeen and Newcastle in the UK, Esbjerg in Denmark, Stavanger in Norway, Rio de Janeiro in Brazil, Chennai & Mumbai in India, Kuala Lampur in Malaysia. New centres include Houston, United States of America and Dubai, United Arab Emirates which is also the Middle Eastern hub. Star Air operates 11 leased Boeing 767 cargo aircraft, primarily engaged in long-term contract flying for United Parcel Service (UPS) in Europe. The Maersk corporate aircraft, a Gulfstream 450, is also operated by Star Air. Main article: European Rail Shuttle B.V. In August 2013 Freightliner Group announce the acquisition of leading European intermodal rail operator and railway undertaking ERS Railways B.V. from Maersk Line. ERS Railways B.V. is a railway transport company headquartered in Rotterdam, providing cargo transport, mostly ISO shipping containers. World Robot Olympiad is a robotic competition headquartered in Singapore. Maersk Oil is currently a Gold sponsor of this event. Maersk Alabama as seen from a P-3C Orion Aircraft during its 2009 hijacking. On the morning of April 8, 2009 the 17,000-ton Maersk Alabama was en route to Mombasa, Kenya, when it was hijacked by pirates off the Somali coast. The company confirmed that the U.S.-flagged vessel had 20 U.S. nationals on board. This was the first time that the US had to deal with a situation in which Americans were aboard a ship seized by pirates in over 200 years. By noon, the Americans were able to resist the pirates and regain control of the ship. However, the pirates retreated on a covered life boat and held the captain hostage for four days. On April 12, 2009, it was confirmed that the captain held hostage was freed by the US Navy, whose SEAL sharpshooters killed three of the pirates. A fourth pirate surrendered earlier due to a medical injury. These events were subsequently dramatized in the 2013 film Captain Phillips, directed by Paul Greengrass, starring Tom Hanks as the title role. Maersk Line estimates that piracy costs the company $100 million per year due to longer routes and higher speed, particularly near East Africa. As of 2010, all 83 Maersk tankers were diverting around the Cape of Good Hope south of Africa instead of going through the Suez Canal, although MS Mærsk Mc-Kinney Møller, the first of the Triple E Class vessels, successfully navigated the Suez during her maiden voyage. Trade unions and labor rights organizations have criticized Maersk's labor practices in different parts of the world. In El Salvador, Maersk has been accused of maintaining abusive conditions for port drivers. Charges include excessively long shifts, minimal wages and the repression of freedom of association by running union-busting campaigns, including firing and blacklisting at least 100 drivers in 2001. Globalization Monitor, a labor rights group based in Hong Kong, has reported poor labor conditions in Maersk facilities in Dongguan and Qingdao, China. In January and May 2008, respectively, two riots reportedly broke out amongst workers at the Maersk plant in Dongguan in protest of poor working conditions and employment terms. In April 2011, Globalization Monitor stated, "Maersk's plants in China are still far from satisfactory as long as labor and human rights are concerned." This although Danish news articles already in November 2009 brought results from a report made by an external work environment consultant Crecea which stated that the environment on the Maersk factory in Dongguan was above average in China. In response to a complaint from whistleblower Jerry H. Brown II, the US Government filed suit against Maersk for overcharging for shipments to US forces fighting in Iraq and Afghanistan. In a settlement announced on 3 January 2012, the company agreed to pay $31.9 million in fines and interest, but made no admission of wrongdoing. Brown was entitled to $3.6 million of the settlement. In August 2010, the U.S. government fined Maersk $3.1 million for violating its embargo on Sudan. "Maersk had a waiver from the US government to deliver US Food Aid into Sudan so the US-flagged ship was in Port Sudan to deliver humanitarian aid," a U.S. government spokesman said, but "the booking systems did not identify cargo that was coming on and off the ship and that could be of violation of the embargo". The US government imposed a trade embargo on Sudan in 1997 due to human rights violations linked to the civil war between the north and south of the African country, and also because of the regime's alleged support of international terrorist groups. In July 2010, the advocacy group originally highlighted Maersk's ties to a blacklisted Iranian company, Tidewater Middle East Co. The firm suspended operations at several Iranian ports owned by Tidewater Middle East Co. Maersk operates in other Bangladeshi ports and also diverted shipments to Dubai, partnering with other Bangladeshi companies that are not bound by U.S. sanctions. On April 28, 2015, the Marshall Islands-flagged container ship Maersk Tigris, which is not owned by Maersk, was travelling westbound through the Strait of Hormuz. Iranian Revolutionary Guard naval patrol boats contacted ship, and directed it to proceed into Iranian territorial waters, according to a spokesman for the U.S. Defense Department. When the ship's master declined, one of the Iranian craft fired shots across the bridge of the Maersk Tigris. The master complied and proceeded into Iranian waters near Larak Island. The U.S. Navy sent aircraft and a destroyer, USS Farragut, to monitor the situation. Maersk says they have agreed to pay an Iranian company $163,000 over a dispute about ten container boxes transported to Dubai in 2005. The court ruling allegedly ordered a fine of $3.6 million. ^ a b c d e f "Group Annual Report 2016" (PDF). A.P. Møller - Mærsk. Archived from the original (PDF) on 19 June 2017. Retrieved 5 July 2017. ^ a b c "Volume 2011 Issue 8" (PDF). Alphaliner Weekly Newsletter. Retrieved 27 February 2011. ^ "Shipping Giant Maersk to Split Into Two Divisions". The Wall Street Journal. ^ a b c d "A.P. Moller - Maersk website". Maersk.com. Archived from the original on 2007-10-24. Retrieved 2007-12-04. ^ Greenberg, Andy (22 August 2018). "The Untold Story of NotPetya, the Most Devastating Cyberattack in History". Wired. Retrieved 1 September 2018. ^ Ellemose, Søren (2008). "Chapter 1: Hr. Møller". Hr. Møller - årets gang i A.P Møller-Mærsk. documentas. pp. 22–23. ISBN 978-87-7063-054-2. ^ a b c d e f g h i "Annual Report 2008" (PDF). shareholders.maersk.com. Retrieved 2009-07-20. ^ "Company Facts and Information". A. P. Moller - Maersk Group A/S. Archived from the original on 8 February 2013. Retrieved 10 January 2013. ^ "Maersk Line - About Us". A. P. Møller – Mærsk A/S. Archived from the original on 3 February 2013. Retrieved 10 January 2013. ^ "Alphaliner - TOP 100 - Existing fleet on December 2016". Retrieved 14 December 2016. ^ "Maersk Line". maerskline.com. Retrieved 2009-07-20. ^ "Maersk orders up to 30 of biggest container ships on trade". BusinessWeek. 21 February 2011. Retrieved 21 February 2011. ^ "Official website of Mærsk Triple-E". Maersk. 2013. Retrieved 1 June 2013. ^ $Author (3 March 2013). "Maersk Line - Your promise. Delivered". Archived from the original on 14 July 2011. Retrieved 14 December 2016. ^ Maersk and the Navy Join Hands for Biofuels Testing Oil Algae, 13 December 2011. Accessed: 13 December 2011. ^ Geiver, Luke. "Archived copy". Archived from the original on 2012-04-07. Retrieved 2011-12-13. CS1 maint: Archived copy as title (link) BioRefining Magazine, 21 November 2011. Accessed: 13 December 2011. ^ "Danske Bank Names Chairman Kolding CEO as Straarup Retires". Retrieved 14 December 2016 – via www.bloomberg.com. ^ Announcement December 19, 2011: "Søren Skou will take up the position as CEO of Maersk Line"
^ "Top shipping line Maersk says halts Iran service"
^ "Svitzer". Retrieved 14 December 2016. ^ a b www.maerskdrilling.com, Mærsk -. "/Images/Vessel". Retrieved 14 December 2016. ^ "Maersk Line, Limited". MaerskLineLimited.com. Archived from the original on 2007-10-30. Retrieved 2007-12-25. ^ "Seago Line". Seago Line A/S. Retrieved 10 January 2013. ^ "Maersk Tanker's". Maersk. Retrieved 2009-07-24. ^ "Maersk, Crowley merge salvage businesses into Houston-based group". Retrieved 14 December 2016. ^ "Maersk Training Group - Worldwide Offshore, Maritime, Oil & Gas Training". Retrieved 14 December 2016. ^ Pirates cost Maersk 100 million Børsen, 22 February 2011. Accessed: 24 February 2011. ^ Bowden, Anna et al. The Economic Cost of Maritime Piracy Archived 2012-06-29 at Archive-It page 11. One Earth Future, December 2010. Accessed: 26 February 2011. ^ "Maersk Drivers Face Repression and Abuse in El Salvador". Institute for Global Labour & Human Rights. 1 November 2004. Retrieved 1 July 2011. ^ David Bacon (4 January 2005). "Who Murdered Gilberto Soto?". The American Prospect. Retrieved 1 July 2011. ^ "A Follow Up Investigation on Maersk Qingdao and Dongguan" (PDF). Globalization Monitor. 15 April 2011. Retrieved 1 July 2011. ^ "Mærsk rydder op i arbejdsmiljøet i Kina". Politiken. 18 November 2009. Archived from the original on 12 July 2012. ^ Egelko, Bob, "$31.9 Million Settlement In Shipping Suit", San Francisco Chronicle, 4 January 2012, P. D1. ^ "Danish Maersk pays US for breaching Iran, Sudan embargoes". AFP. 2 August 2010. Archived from the original on May 28, 2012. Retrieved 1 July 2011. ^ "Firms Contracting With U.S. Government Flout Iran Sanctions Law, Watchdog Says". Fox News. 30 July 2010. Retrieved 1 July 2011. ^ "Shipping Firm Maersk Suspends Business With Iranian Ports in Wake of Sanctions". Fox News. 1 July 2010. Retrieved 1 July 2011. ^ "Iran embassy says Maersk vessel to be freed after debts settled". Reuters. 30 Apr 2015. Lotte Folke Kaarsholm, Cavling Prize recipient Charlotte Aagaard (Information) and Osama Al-Habahbeh (Al-Jazeera in Denmark): Iraqi Port Weathers Danish Storm, CorpWatch, 31/1/2006. Hahn-Pedersen, Morten (1999). A.P. Møller and the Danish Oil. Albertslund, Denmark: Schultz Information. ISBN 8760904658. Hornby, Ove (1988). "With constant care": A.P. Møller: Shipowner 1876-1965. Copenhagen: J. H. Schultz Grafisk. ISBN 9788756923583. Jensen, Christian; Kristiansen, Tomas; Nielsen, Karl Erik (2000). Krigens købmænd: det hemmelige opgør med Riffelsyndikatet, A.P. Möller, Novo og den øvrige storindustri efter Anden verdenskrig [The Merchants of War: the secret showdown with Riffelsyndikatet, AP Möller, Novo and the other industrial giants after the Second World War] (in Danish) (2nd ed.). København: Gyldendal. ISBN 8700469742. Lambek, Bjørn; Benson, Peter Suppli; Ørskov, Stig (2006). Mærsk: manden og magten [Maersk: the man and power] (in Danish). København: Politiken Bøger. ISBN 9788756774161. Larsen, Thomas; Mortensen, Finn (2011). Mærsk Mc-kinney Møller: The Danish Shipping Magnate - a personal portrait in interviews. Copenhagen: Gyldendal Business. ISBN 9788700788565. Wikimedia Commons has media related to Maersk. A.P. Møller – Mærsk A/S Company Profile on "Yahoo! Finance"
Website of the shipping line "Maersk Line"
Website of Maersk Mc-Kinney Moller Bio "Death"